« Pillow Giveaway: FEST Amsterdam! 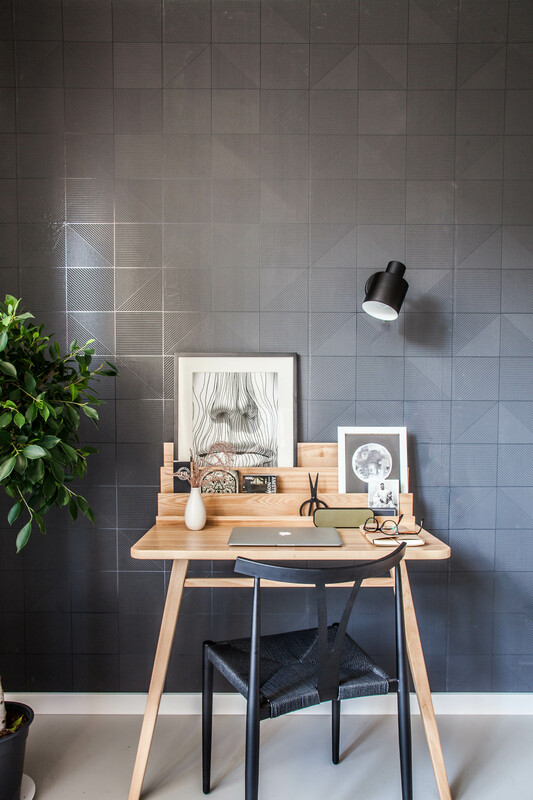 The base was simple and good, and as much as I liked the blue colour on the walls, with a contrasting wall in a textured black wallpaper in the same space, I felt it was a little overpowering, masculine and dark. My initial feeling was that the room needed a pick me up, in terms of light and texture. There were bare walls that needed art and some balance was needed to ground that gigantic sofa in the middle of the room. I proposed that we keep a palette of grey/blue, cognac, black and white but add in texture to balance everything out, paint the walls to lighten things up a bit, update the curtains for something more feminine to balance out the masculine energy in the space and add some art and textured accessories to add a bit of personality. 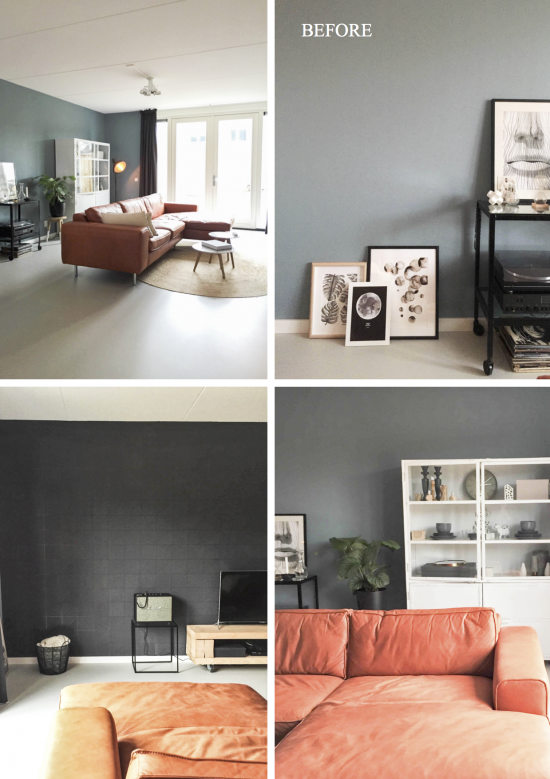 We started by painting over the blue with Farrow & Ball’s ‘Strong White‘ – a very pale shade of warm grey to work with the existing light grey floors but add a bit of depth to the space as opposed to using a true white. Once the walls were painted, we started layering in the accessories. First things first. 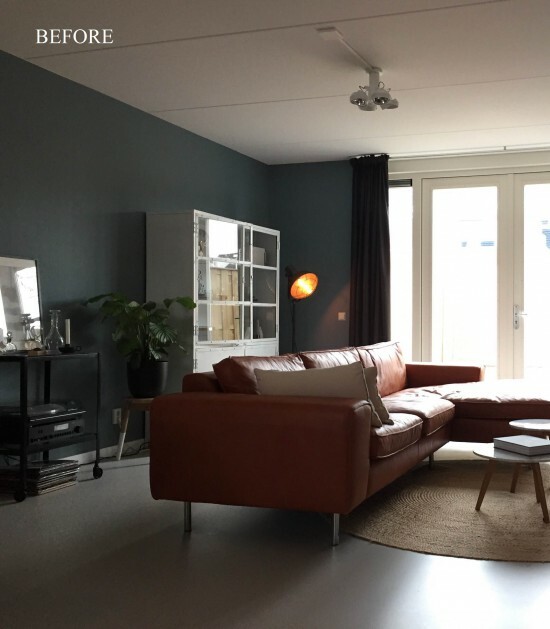 When I first saw this room I felt that the circular rug was too small to stand up to the size and shape of the sofa. I wanted to see a large, textured will rug to balance out the cool surfaces and ground the space. We chose this rug by HAY for it’s chunky woollen surface. Instant cosy factor! 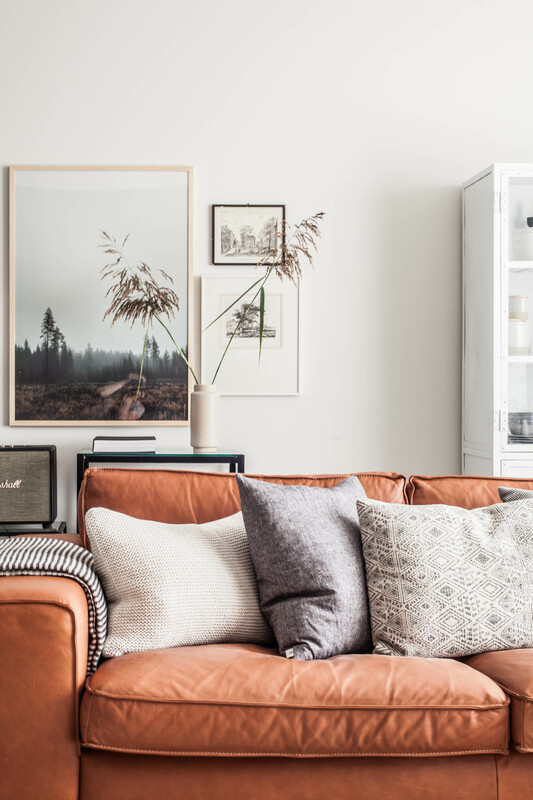 And while we’re on the topic of adding texture, with that huge surface of leather in the room, a bunch of pillows were added next to soften things up and boost the cosy factor. This couch is now perfectly snuggle proof but not overdone. We used pillows with a variety of textures, tones and pattern but were careful not to go overboard. 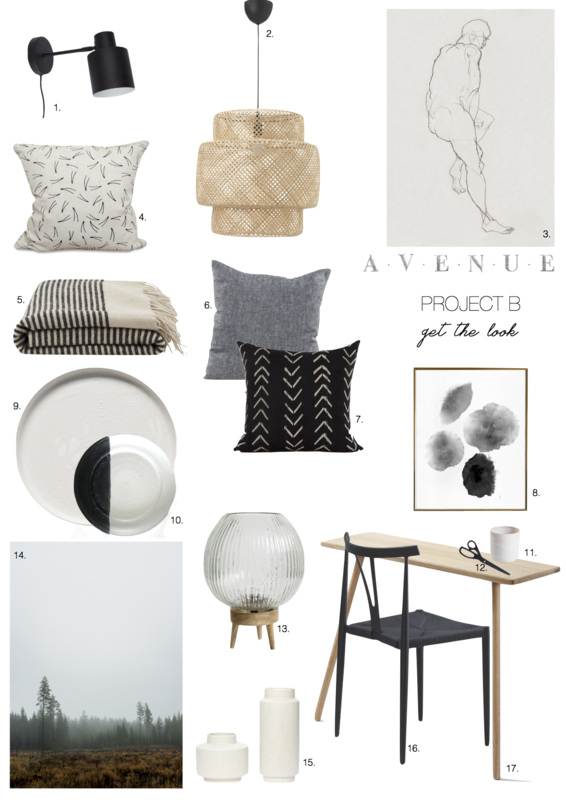 By Mölle’s chunky knit and linen pillows remain a favourite of mine because of the subtle texture they add to a space. The plan was to add a round wooden coffee table but we hadn’t managed to pull the pin on one by the time we shot this space, so I grabbed a little white table from the bedroom and it worked, combined with a little marble table the couple already had from Zuiver. 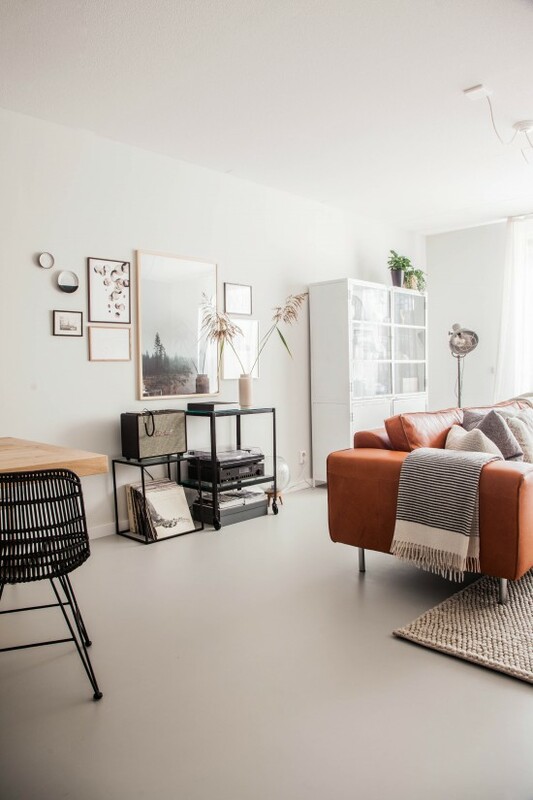 A round vintage table in walnut with slender lines would finish off the living area nicely I think to add some darker wood tones and shake things up a bit style wise. Where there was previously an empty space beside the TV, we added a little leaning writing desk and chair. 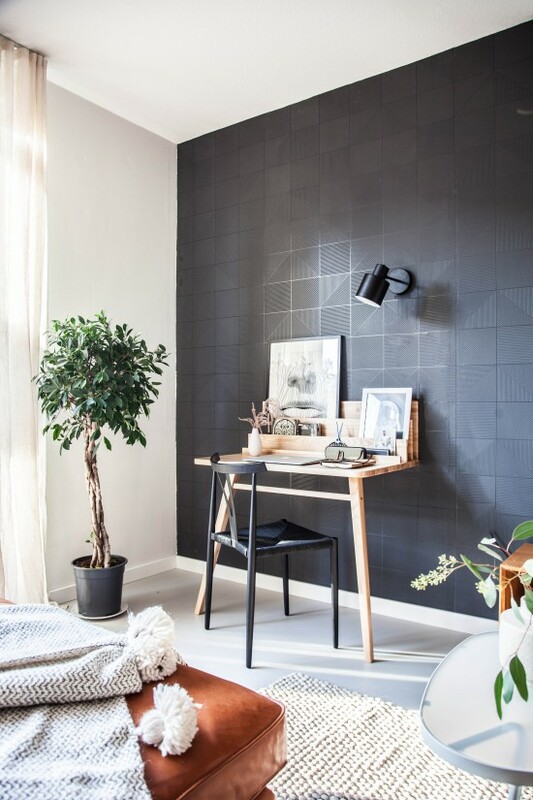 We added a wall sconce from Hübsch (Avenue Lifesyle is a supplier of this lovely Danish lifestyle brand so if you’re interested in purchasing this lamp, get in touch). One of my favourite changes we made to the space that made an instant difference to the light and overall feeling of the space were the linen curtains. Light and whispy, these are the same curtains I used in the Project H Bedroom and never fail to disappoint. I like it when curtains pool a bit onto the floor, don’t you think it looks beautiful too? It just makes everything feel so much more lush but at the same time very relaxed. 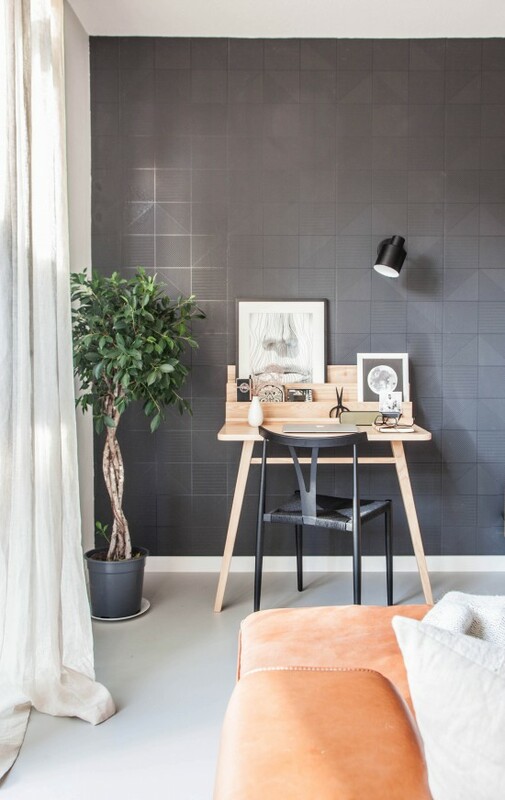 We then tackled the issue of bare walls and unused art. 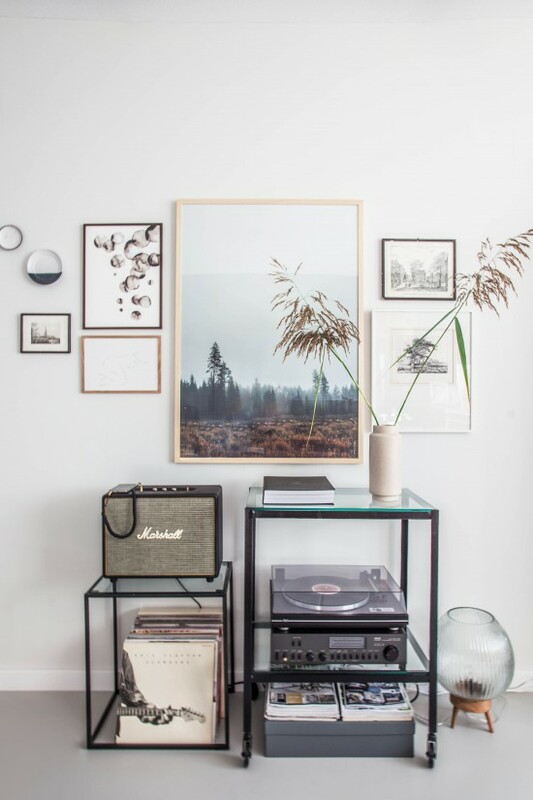 We created a gallery above the couple’s record and music station using pieces they already had, which we had freshly framed, as well as some new pieces – that gorgeous landscape from Fine Little Day and ceramic plates I found on Etsy by Jude Allman are definite favourites. Into the mix we added a few historical sketches to balance out the contemporary pieces and add some personality. 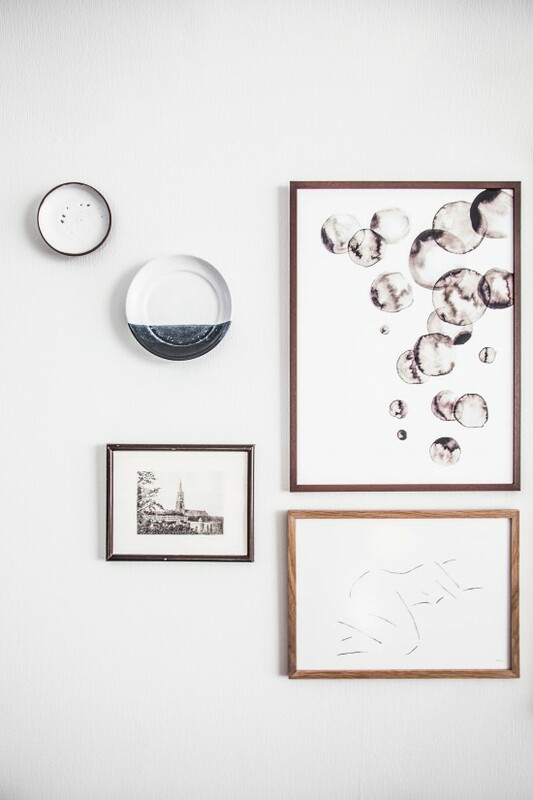 While the gallery looks great as is, it is also a place they can easily add new pieces to as they go along. There’s a whole wall to fill after all. 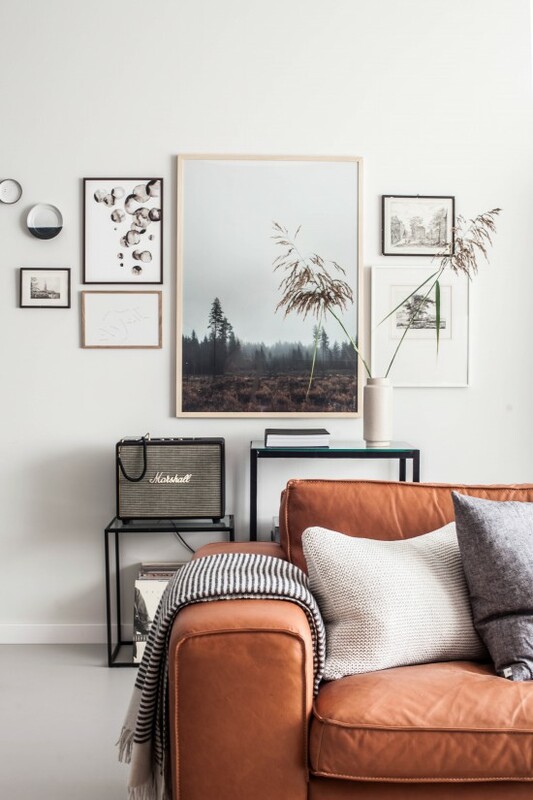 My general rule of thumb with gallery walls is to stick to a bit of a theme where colour, style and frame materials are concerned but don’t be too specific or uniform. 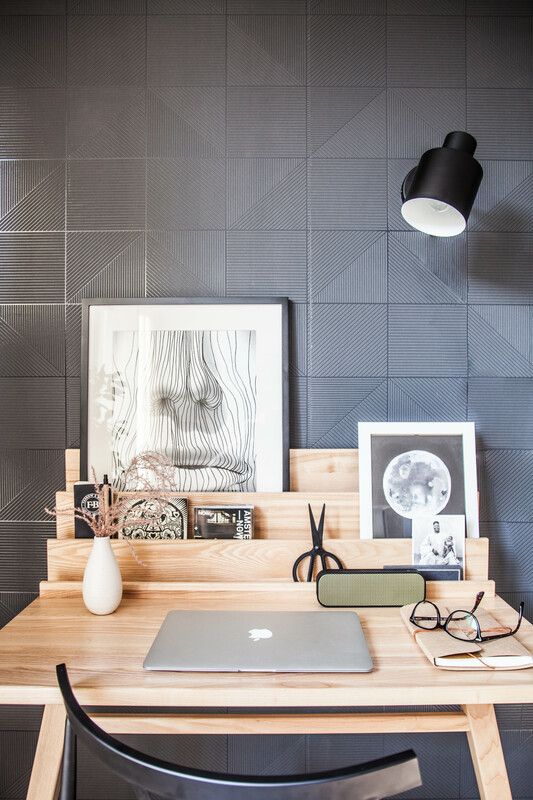 The little ceramic plates add something fun and whimsical about this wall even though the general feeling is very put together. 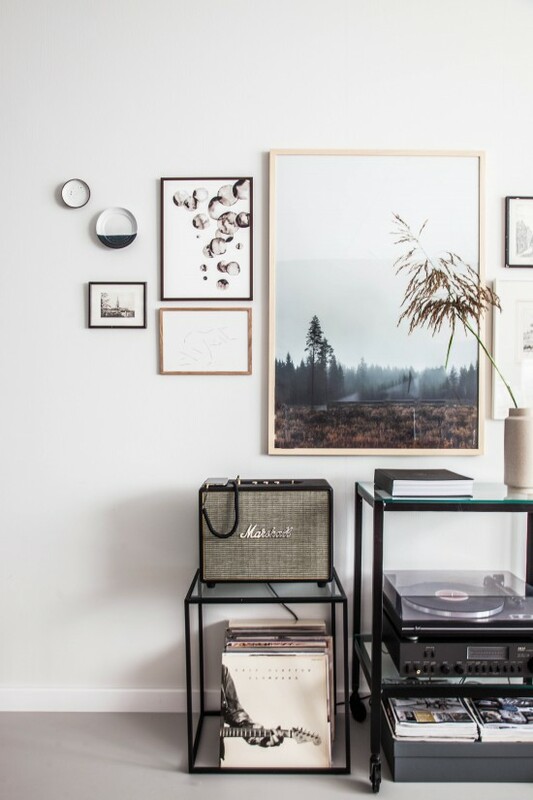 How to create an eclectic gallery wall? Click here to find out, I wrote about this topic a few months back. A modern earthenware vase with a couple of grassy stalks add a textured but sculptural factor to finish off this vignette. Lastly, I shuffled some things around inside the vitrine cabinet, adding some new pieces and using primarily what the couple already had. 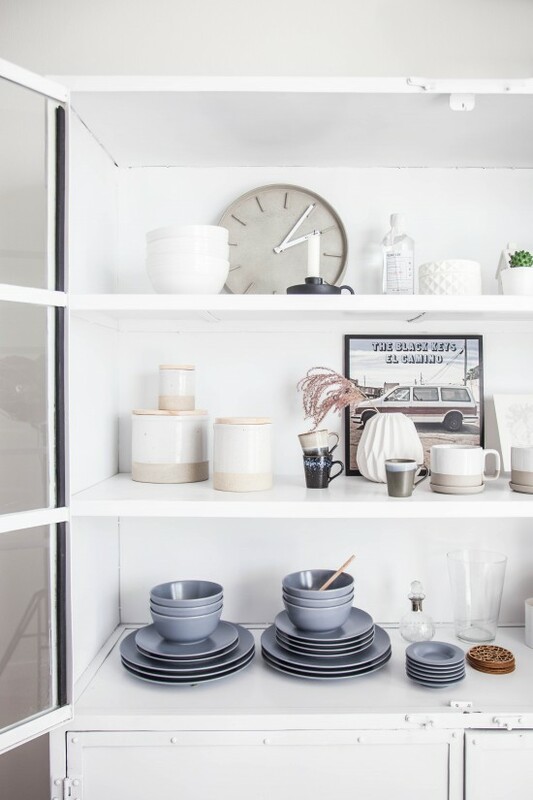 Layering art and sculptural pieces help to add excitement to the inside of a cabinet, while keeping practical items sparsely placed helps to make sure it’s not too crowded in there. So that’s it! 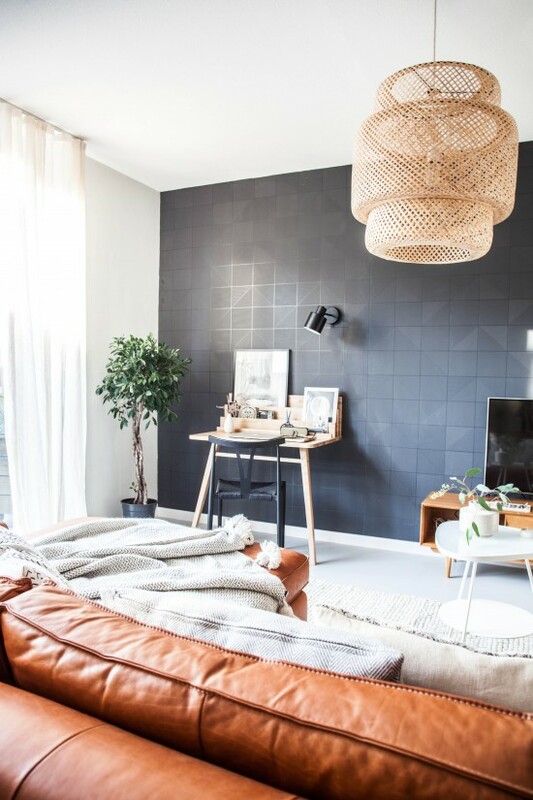 A few minor changes and small additions and the results are a much warmer and put together space that is cosy and textured, while still maintaining that edgy, masculine vibe the client wanted. They are thrilled with the results, which makes me so happy! 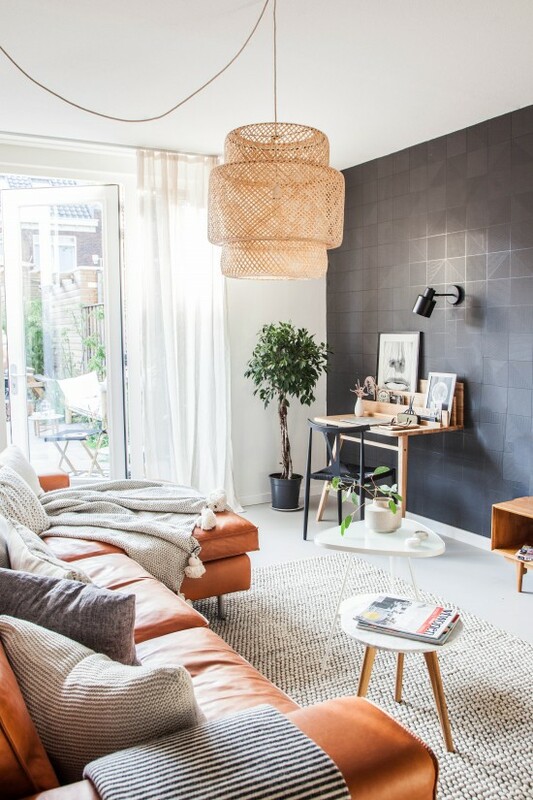 Add Light – enhance natural light to give the space an airy and relaxed feel. Balance high contrast hues with subtle tones. Spot something you like? Shop the look below or shoot me a comment if you would like to know the sources of anything else in this space. Hope you enjoyed this little tour and were able to take something away to help you add some texture and cosiness to your own living rooms, especially readers in the northern hemisphere who are experiencing the first chills of Autumn. Scrap that, it’s downright freezing here in the Netherlands already and winter hasn’t even started! 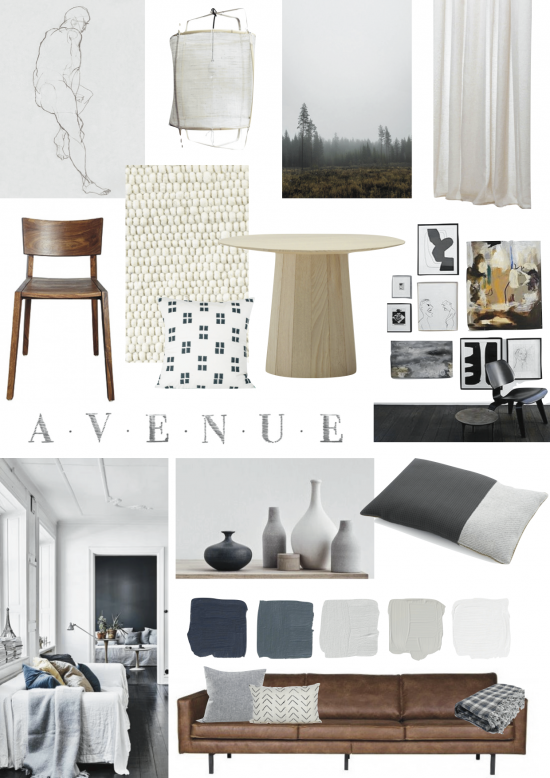 I’ll take that thick woven wool rug and cosy pillows, thanks! Back soon to take you through a very inspiring ceramics studio belonging to one of the coolest ladies I know. 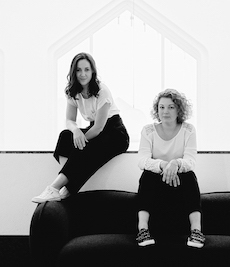 Dear Holly, we’re did you get the leaning desk you used in the styling? It is a different one from the one you have in the link, right? And do you happen to know where the metal cabinet is from? Thanks and regards from Hamburg! Simly beautiful as usual Holly! Love it! Really amazing how this room was transformed with the use of a few but very beautiful accessories! Can I ask where the tassel blanket is from – I’m loving anything with tassels at the moment! Love the room? This room is beautiful and such an inspiration! Congratulations. 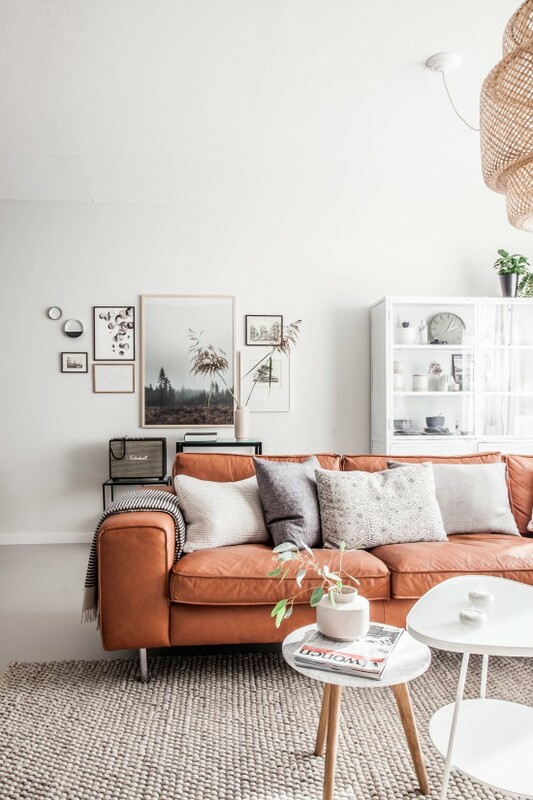 Could you tell me where the leather sofa and the bubble photo are from? I would really appreciate it. 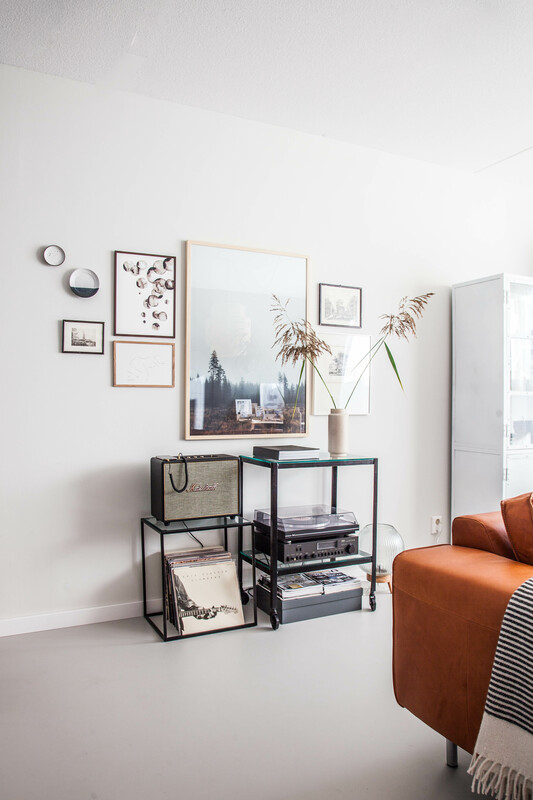 Loved what you did to freshen up the space and add details that don’t feel cluttered. Do you happen to know where the couple found their cognac couch? I’ve been on the hunt for one like this with a lounge bank!